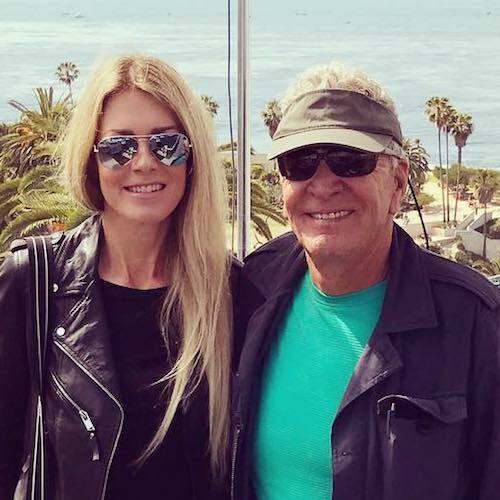 It was in 2001 on the sunny shores of Waikiki Beach, Honolulu that Bruno Schwarz decided to center his family business on a sailboat charter. San Diego’s enticing and gorgeous weather made the perfect location and the oceanfront city eventually became Aolani’s birthplace and home. 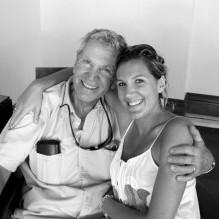 With the help of his daughter Lindsay, Bruno recruited expert catamaran designer Kurt Hughes to craft the Aolani, a gorgeous 58-foot Sunchaser American catamaran. Since their humble beginnings hosting football fans watching Super Bowl XXXVII on their maiden voyage, Bruno and his family have gone on to sail with 75% of all Fortune 500 companies, a remarkable and unparalleled achievement in the boat charter industry. 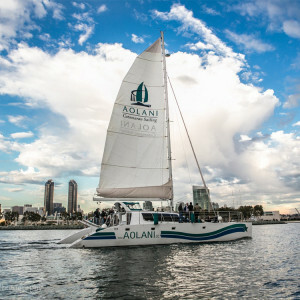 The Aolani is San Diego’s most versatile vessel, and the only San Diego boat charter that can comfortably fit 48 passengers on the outer deck or in its spacious salon interior. Although it has the benefit of twin 230 horsepower Yanmar turbo diesel engines, the Aolani is primarily a sailboat and the only vessel in San Diego that is Coast Guard certified to sail out onto the open sea without limitation. Wherever you choose to cruise, we get you there quickly with our powerful engine so afterward, you can enjoy the peace and quiet of a majestic, wind-powered sail. 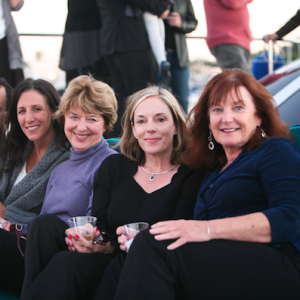 Our crew is like family to us, and we think that after you experience one of our amazing day cruises, you will feel like you are part of the family too. 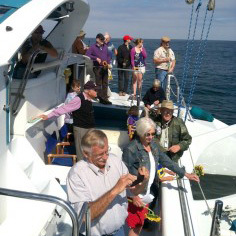 Now that you know a bit more about Aolani, let us help you plan a spectacular event on our beautiful catamaran! Give us a call today! Please refer to our FAQs if you have any questions about the Aolani! 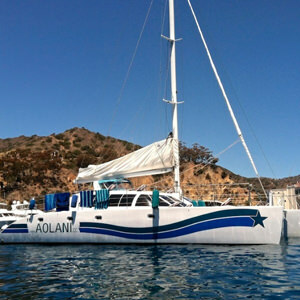 Designed by renowned catamaran designer Kurt Hughes in Seattle, WA, Aolani Catamaran is a 58’ Sunchaser American Catamaran. We completed building her in 2003. She is 58’ long with a 32’ beam. Sails are approx.. 1500 sq. ft. without spinnaker. US Coast Guard licensed for 48 people, plus crew. 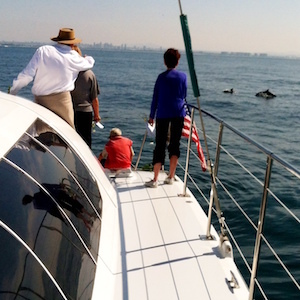 We are certified to sail in the open ocean, most charter boats have to stay within the San Diego Bay. Engines are twin 230 horsepower Yanmar turbo diesels, 10KW generator, full electronics, netting forward, 4 vacuflush heads. 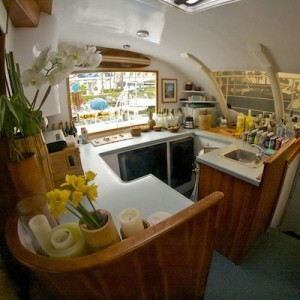 Large galley which serves to inside and out, refrigerator and ice-maker, a large interior salon with 360 degree views. 4 standard staterooms: (2 queen and 2 double), and 2 staterooms for captain and crew. Hull is made out of state of the art composite/epoxy, honeycomb and fiberglass, built in a female mold with triaxial woving, light weight vessel for maximum sailing performance. Originally designed for a capacity of 69 guests, the US Coast Guard certifies these catamarans for 48 guests so there is plenty of space for all guests. You may have all your guests within the cabin interior if it is raining, cold, foggy or windy, or everybody is able to be on the outside. 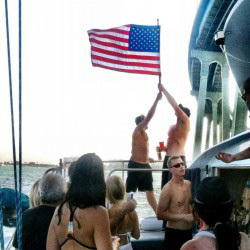 We believe we are the only 48 person sailboat in San Diego where everybody can be on the inside or on the outside at the same time. Aolani is primarily a sailing yacht, however, if you should prefer a motor yacht we will not hoist the sails and then she is a motor yacht. Wouldn’t you rather have the wind in the sails rather than loud, smelly engine interrupt your hours at sea? 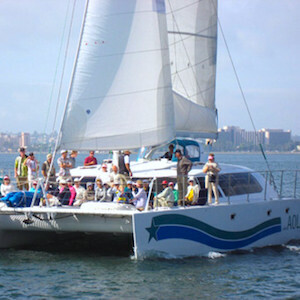 San Diego Catamaran Sailing is the number one attraction in Maui, Hawaii and Key West, Florida. Experience the thrill of fast sailing with this lightweight and attractive vessel. When you leave this boat we want you to have experienced a great sailing adventure.